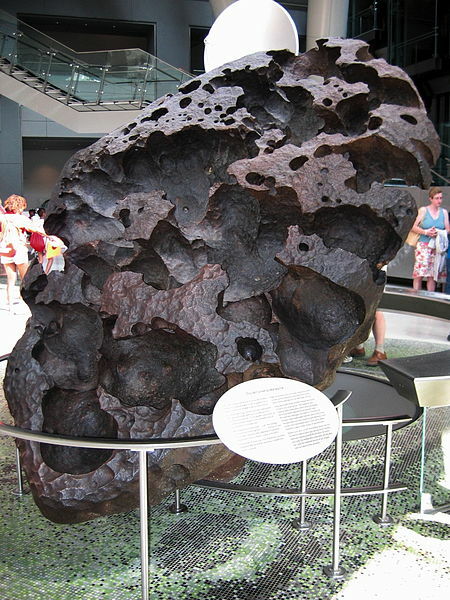 The Willamette meteorite is the largest meteorite ever to be found in the United States and the sixth largest in the world. It is a fantastically shaped oriented giant weighing 15 tons. It began a tale of controversy almost the moment it was discovered in 1902. It was found by an Oregon local who stole it with great difficulty by moving the giant ¾ of a mile to his own property. His crime was discovered and the ownership given to the landowners where it had originally rested. It was later sold and then donated to the American Museum of Natural History in New York where it still is on display today. But, controversy again arose in the 1999 when the tribal leaders of the Grand Ronde demanded the return of their venerated stone. An agreement was reached the allowed the tribes access to the meteorite once a year for ceremonies while leaving the meteorite where it is. Willamette is a medium octahedrite type iron and seems to have landed at least 13,000 years ago. It appears to have been transported by glacial action to the location where it was discovered. Only a small amount of the meteorite has ever been cut off and there has been controversy on most occasions when attempts have been made to sell specimens. Meteorite Falls – Why Are Some Meteorites A Fall? © 1996–2019 The Meteorite Exchange, Inc.